This is what happens when your husband goes shopping and buys mangoes and cucumbers. 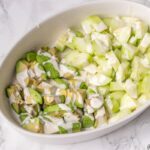 You make cucumber mango salad! 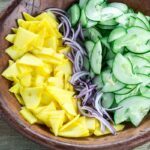 This salad combines an interesting blend of ingredients: mango, cucumber and a little red onion. But let me tell you this: it is insanely good! I totally took a trip to salad heaven with this one! You know, after devouring plantain chips and chocolate chip cookies, I needed a salad to wash my eating sins away. Thank goodness Mr. N had bought some cucumbers and mangoes – very salad worthy ingredients if you ask me. The lemon was used in the dressing. So I put out my box grater and used the slicing side to slice the mangoes (after peeling of course!) I also cut the cucumber in half then sliced with the slicer. And I equally sliced the onions using this epic slicer. Just in case you were wondering, the slicing side of my box grater is what gave me these epic ultra thin beautiful pieces of mango, cucumber and onion. I placed all my sliced goods in a bowl then I made some epic dressing. 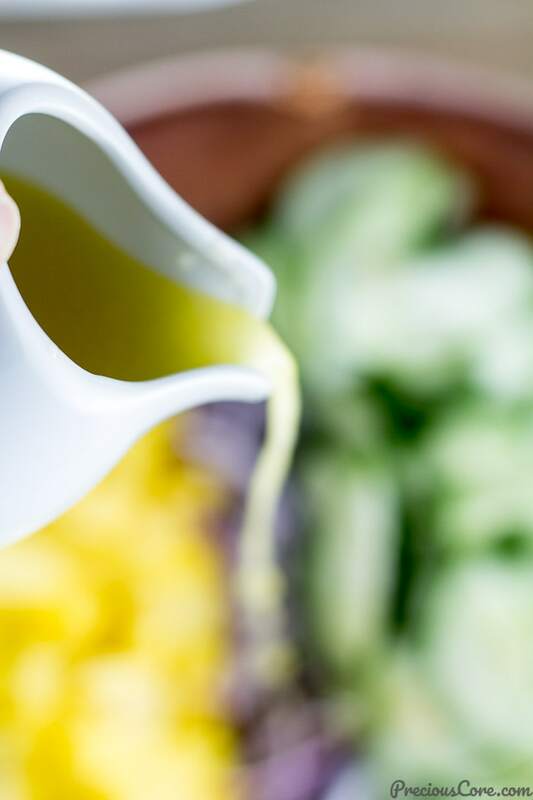 Lemon, olive oil, honey and salt are all you need for the dressing. I almost shouted for joy when I tasted it!. 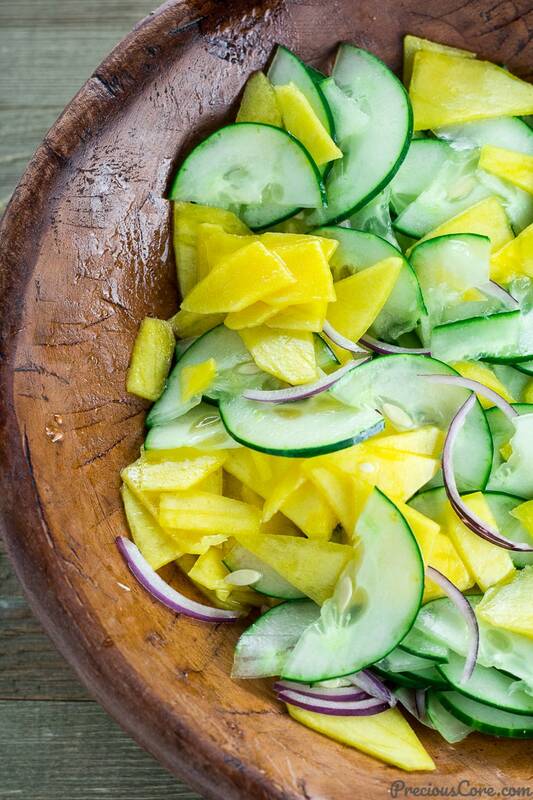 It is sweet, slightly tangy and it marries well with the cucumber mango salad. 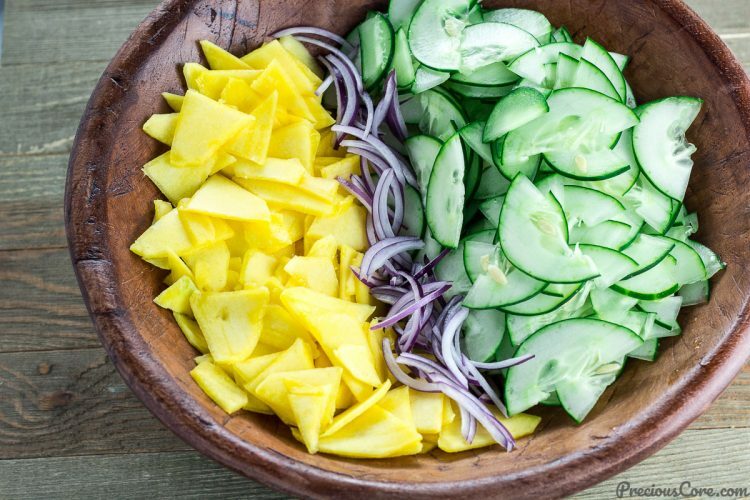 This cucumber mango salad! Print the recipe. Go get the ingredients. Go make some. Your body needs it. Your taste buds need it. You will be amazed! 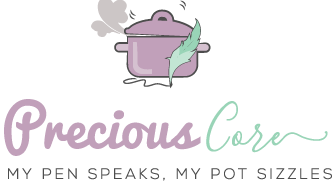 I have always loved creamy dressings but light simple dressings like the one used in this recipe are life! It really helps that they are guilt free and totally customisable. They can be made with honey, without honey, with salt and black pepper, without pepper, with mustard, with herbs, and so on. The possibilities are endless. 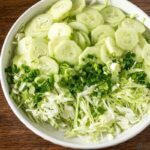 The dressing is the icing on the cake in this cucumber salad as it gives it a sweet, slightly tangy and fruity overall feel-good ambience. Every forkful of this cucumber mango salad is epic. So light and refreshing. 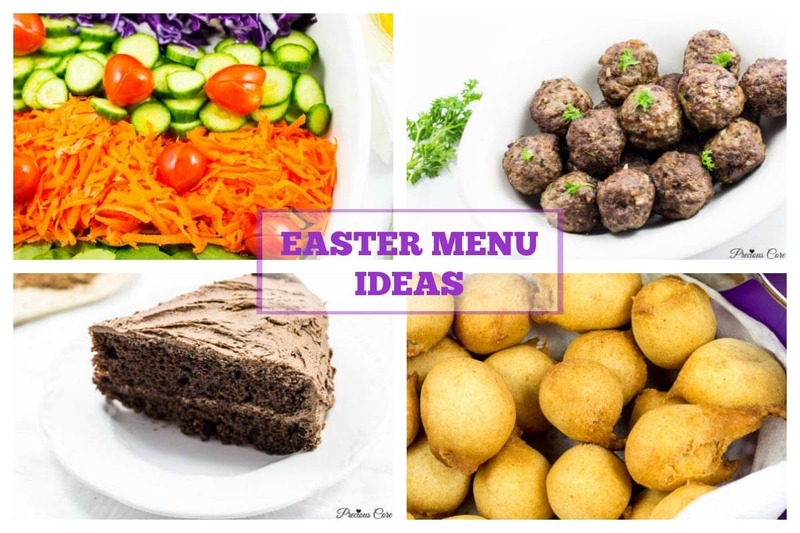 It is one recipe that you will want to make over and over again because it is so simple yet so good! This salad will serve as a good side dish for barbecues, parties, dinner, you name it! It is also great for entertaining guests. Wow your guests with this elegant salad. It tastes even better after the cucumber and mango have marinated in the dressing for a while. I put some in Mr. N’s lunch box and he completely loved it. I topped his with some avocado because avocado… Let me just say here that avocado matches so well with the cucumber and mango in this salad. So I highly recommend you try adding some avocado too. 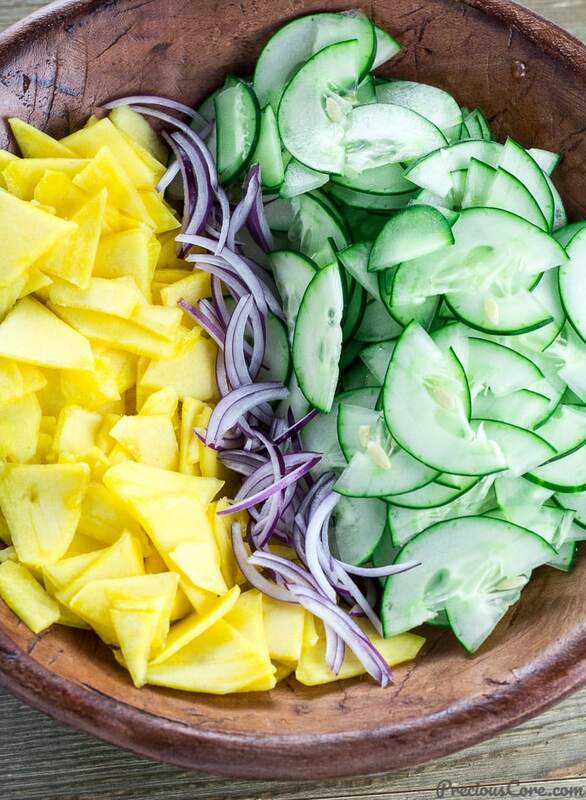 But first, go make some insanely delicious healthy cucumber mango salad and enjoy! Don’t you just love when inanely delicious and healthy exist in the same sentence?? If you make this recipe, please take a moment to rate it below. Also, share a picture with me on Facebook or tag me on Instagram. I’ll love to see! This cucumber mango salad is the truth! Fresh, crunchy, sweet, slightly tangy and just so good! The best part is it is so easy to make. 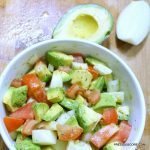 Serve this salad as a side dish for barbecues, take it to a potluck, make it for a party, use to entertain guests at home or make it for yourself and enjoy! Enjoy, friends! 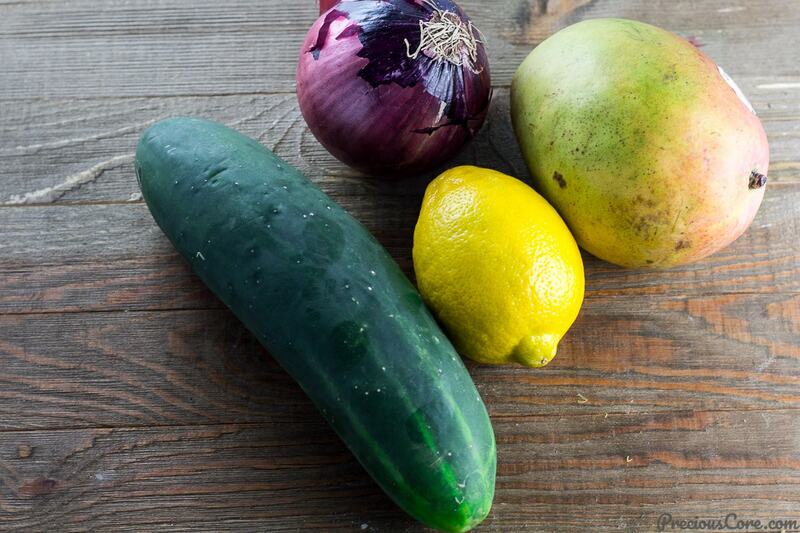 Chop the cucumber and mango and place in a large bowl together with the onion. Mix all ingredients for the dressing in another bowl then pour over the salad. Toss to combine and serve! 1. 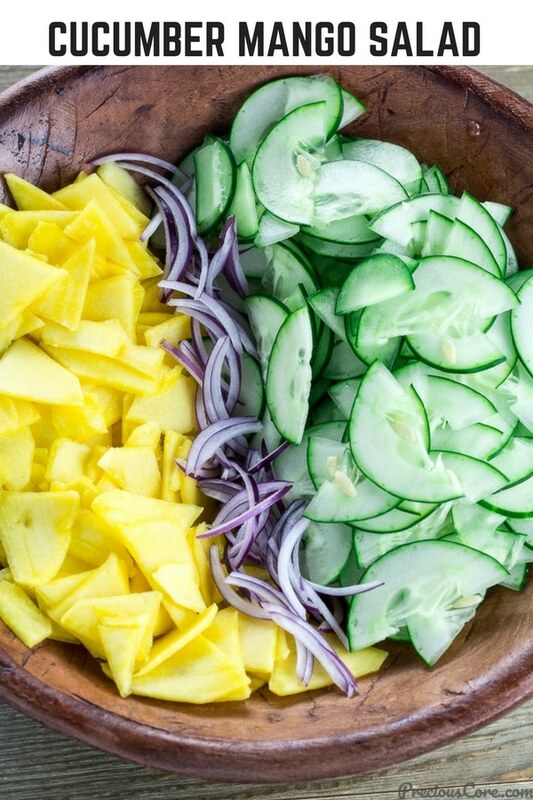 Use a mandoline slicer to get thin even cuts for the cucumbers, the mango and the onions. The mandoline slicer makes life better in the kitchen! I can't believe I have had a mandoline slicer for so long and I wasn't using it enough. 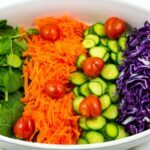 I read this post by The Stay at Home Chef that suggested using it to slice even onions. And I tell you, "onions have never looked so beautiful! So use a mandoline slicer for beautiful slices or the slicing side of a box grater. They are basically the same thing! 2. Use mango that is just ripe and firm to the touch. Mushy mangoes won't produce clean slices. 3. Measure the olive oil first then use the same spoon to measure the honey, The remnant of the olive oil on the spoon helps the honey slide easily from the spoon. 4. 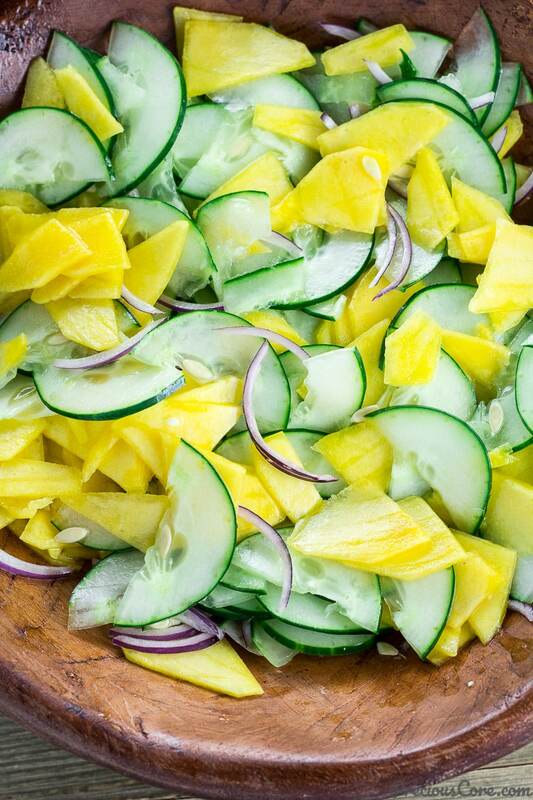 This cucumber mango salad will keep for 2-3 days in the fridge. 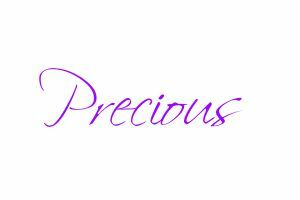 Working without stopping to pray is like using up fuel in a car tank without stopping to refill. Soon you will run out of fuel and be unable to function. So PAUSE and PRAY always. If you are referring to the picture of the uncut fruits then that is lemon. I used it in the salad dressing.